The Russian government will finance construction of new terminals at the airport of Perm and Anapa under the auspices of an investment project support program organized by the Ministry of economic development. All in all, the ministry chose 11 objects eligible for state support, the government body said in a statement. Perm airport, located near the Ural mountains, will receive 3 billion rubles ($50 million) in state loans to support construction of a new passenger terminal and other infrastructure objects of 29,800 sqm. The total cost of construction is estimated at 5.43 billion rubles ($90.5 million). 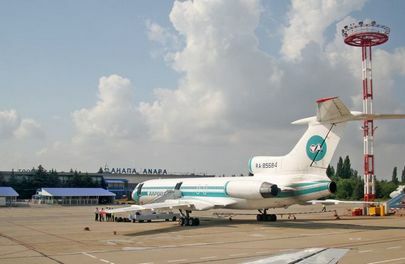 Anapa airport, located on the Black Sea shore, plans to spend 1.29 billion rubles ($21.5 million) for construction of a new terminal. The airport is managed by Basel Aero company, which is investing in the reconstruction projects, so the amount of state loans won’t exceed 0.8 billion rubles ($13.3 million). According to RBC newswire, the government will support the projects by providing the loans with Central Bank key interest rate (11% as of October 26) plus 1% annual interest. Should the key rate change, the contract may be revised. Construction of the new terminal has already started in Perm. The three-storey building with three terminal fingers and five jet bridges and annual capacity of 2-3 million passengers will become operational in 2017. It may be further expanded later on. After all passenger operations are transferred to the new terminal, the old building will serve a different purpose. In Anapa, a new terminal is supposed to compliment the existing one by increasing capacity to 700 passengers per hour, up from current 400. The new building should enter service in 2016. In the first nine months of 2015 Perm’s traffic exceeded 1 million passengers, similar to the same period last year. However it served 15% less aircraft movements. Last year Perm occupied 23d line in Russian airport rating with 1.3 million passengers served. It has been going down one line in the list for the last two years at least. Anapa Airport, by contrast, is going up. It served 1.1 million passengers in the nine months, showing 18% YOY growth. By 2014 results it was 26th in the rating, up from 28th in 2013.